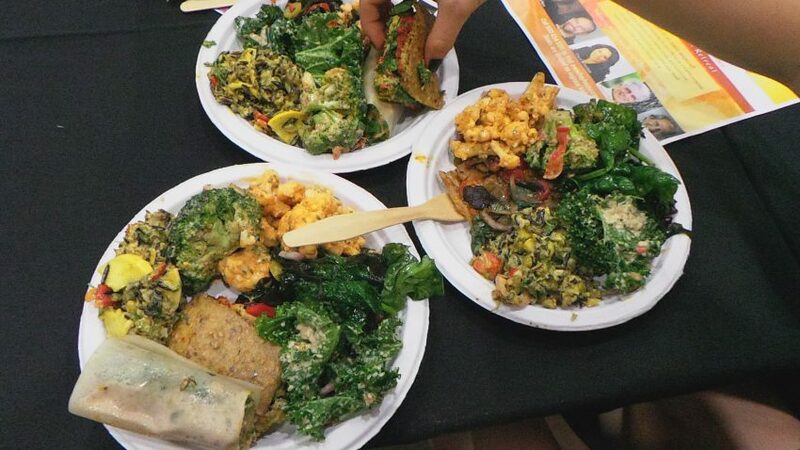 Finding Balance, Household Environment, Mind & Body Health, Money, Energy, Value & More! 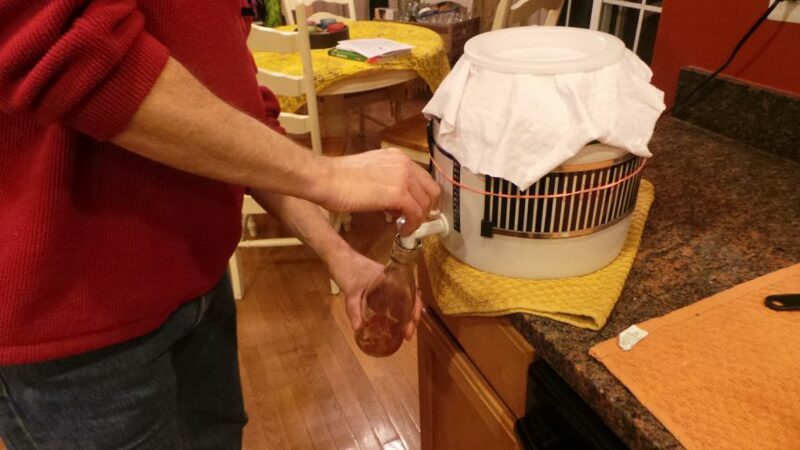 Facilitating the cycle of the SCOBY, or making kombucha, has been a monthly ritual of ours for many years. I am not sure what originally prompted our interest in this probiotic beverage. 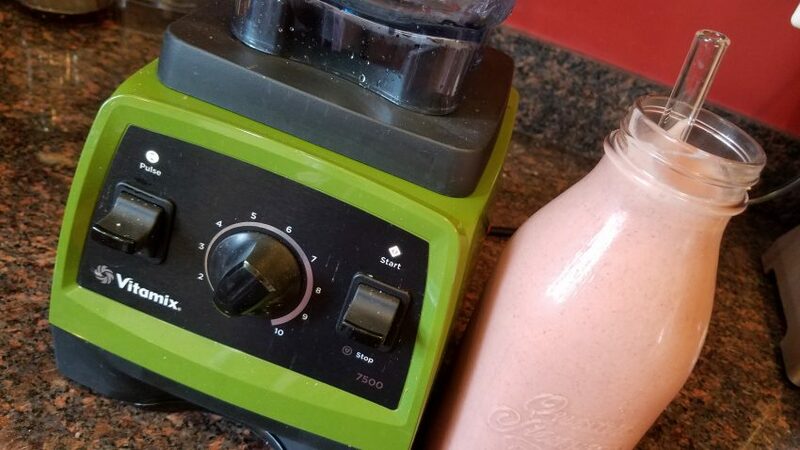 I know my father-in-law had dabbled with it way back, and we remembered his stories of friends that had touted the benefits of this “fermented mushroom” elixir. 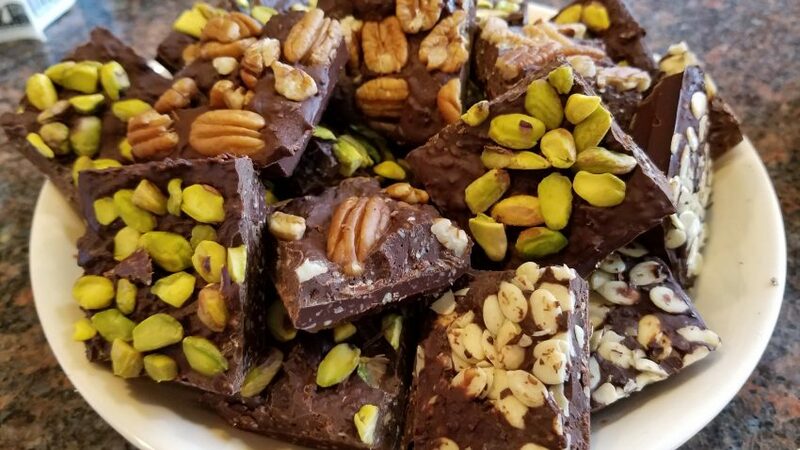 We had tried a few times in earlier years to get a routine going with it, making a batch or two, but never with any consistency. Then, as kombucha became more mainstream and began appearing in regular grocery stores, we started buying it fairly regularly, as a healthier beverage treat. After awhile, the cost of our regular consumption encouraged us to give making our own another go. We experimented a bit in the beginning with different teas and sweeteners, but we quickly got it down to a science, just using an organic mix of green and black teas and organic sugar. 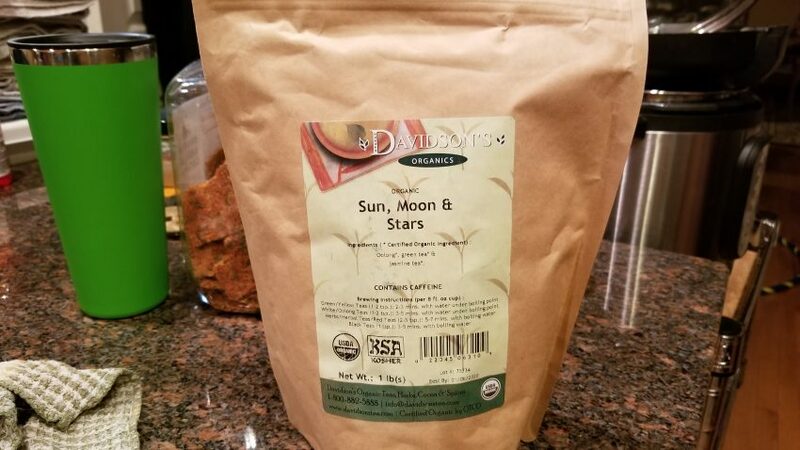 Our favorite tea is the Sun, Moon & Stars mix from Davidson’s Tea, which we’ve used fairly exclusively for years. And, as with many things, once you find a system that works, it’s easier to keep it going. We did have a few experimental batches in the beginning, but we soon streamlined the process, and with a little teamwork, we bottle the previous month’s batch, start a new one, and, clean up the aftermath in under an hour. HEALTHFUL ELIXIR OR TOXIC TEA? 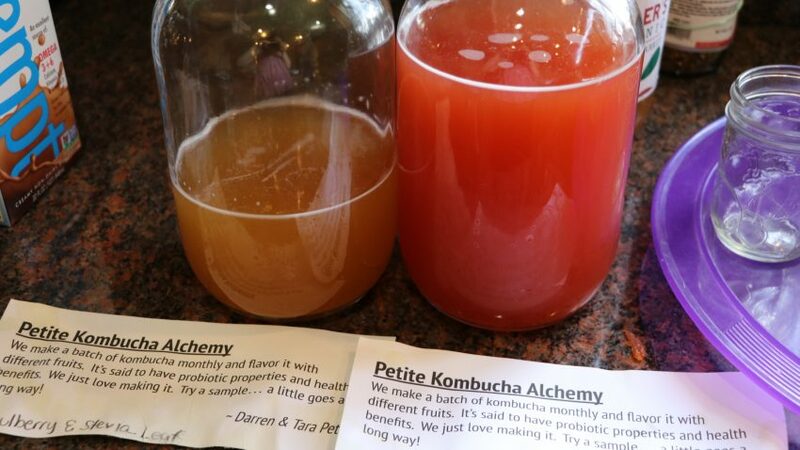 Just because we have the process of making kombucha down to a science, does not mean there is a lot, if any, scientific data to back-up any benefits to regular consumption of kombucha. There is an abundance of anecdotal accounts of its healing effects, as well as, stories claiming its toxic impact on health. My husband and I have consumed, maybe 4 to 10 ounces each, most days of the week, for years, without incident. While there may be health benefits, or even some level of toxicity, I guess it is minimal, because we have not noticed significant impact to our health, for better or for worse. We just enjoy the process and the taste, and allow ourselves to believe there are some probiotic benefits to the brew. 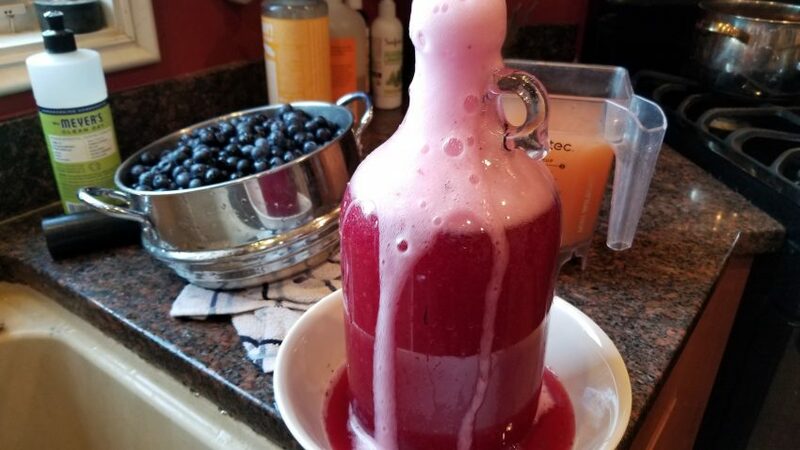 Nonetheless, when taking on your own kombucha brewing project, do your research, always ensure good sanitation, and make note of how you feel when you drink it regularly. Your own experience will likely be the most useful information you will get, with regards to its health benefits. But, with its popularity these days, I suspect more studies and research will be done on the topic. So, be sure to do an occasional Google search to stay up to date with the latest information and adjust your opinion of kombucha’s healthfulness accordingly. Leftover SCOBY & starter liquid to pass on to a friend. If you are brewing your first batch, you will need to get a SCOBY in some starter (just some unflavored kombucha from someone else’s previous batch). Chances are, if you ask your on-line friends, you’ll be able to track one down with no problem. But, if your friend pool does not include kombucha enthusiasts and you cannot locate a nearby SCOBY, just head on out to your local health food store, or even grocery store, and get yourself a good quality bottle of UNFLAVORED kombucha to use as your starter. It will take a little longer to grow a good-sized SCOBY, but it will usually do the job. Make sure the commercial brew is, in fact, real kombucha, and not some flavored fizzy beverage with added flavoring and sugar. Our original batch in 2014, using Oolong tea bags, a SCOBY we bought online & a bottle of plain GTS kombucha for the starter. 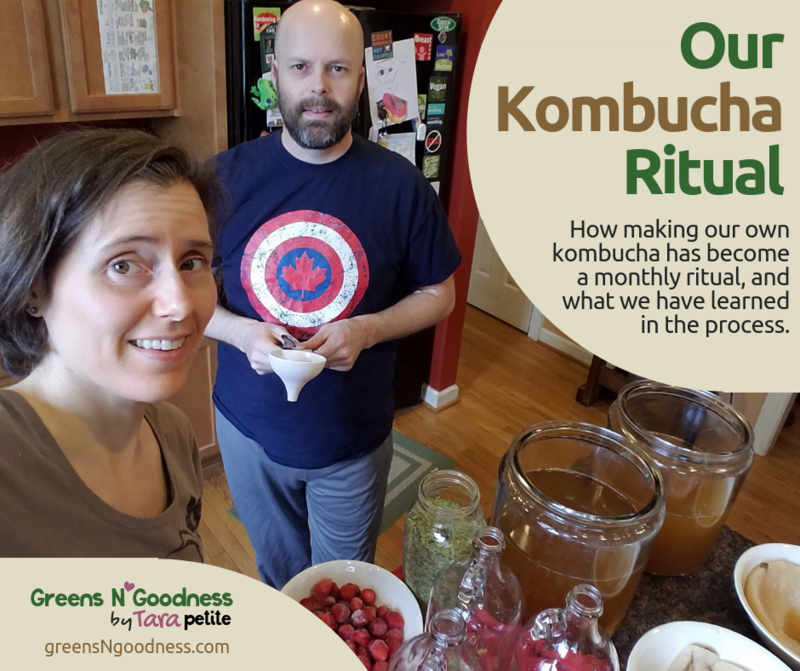 We started our kombucha monthly ritual with a SCOBY we bought online years ago, like this one, as well as, one bottle of GTS organic and raw original flavor kombucha for extra starter liquid. Since then, we have produced a surplus of SCOBY every month, saving some to pass on occasionally. I have heard of people dehydrating the surplus SCOBY to make dog treats, but I think it makes good food for the garden, so we just put it in the compost pile to nourish whatever random things grow out there in our neglected garden patch. 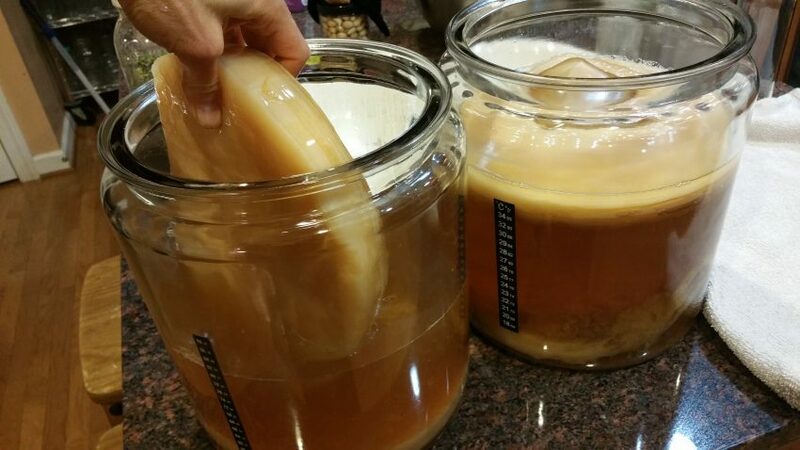 Big SCOBY… plenty to share from our 2 gallon jars! We explored all the options for housing our symbiotic cultured concoction. At one point, we tried the continuous brew method, using the bottom porcelain part of a water dispenser. This method has its perks, with never really having to remove the SCOBY and just pouring fresh tea in every month, after using the spigot to fill bottles, draining the last batch down to just the SCOBY and a bit of starter liquid left in the container. However, since we let our batches brew a full month, I found, from a sanitary standpoint, I just feel better washing the jars each month and starting fresh. Plus, the spigot at the bottom ended up being more messy than it was worth. Not to mention, we enjoy brewing in clear jars, so we can easily peek in and see what’s going on in there! 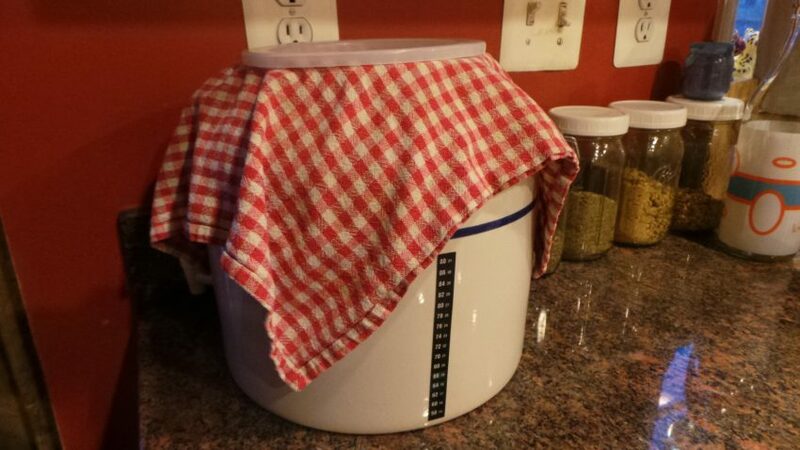 Continuous brew container for kombucha. Next, we thought multiple half gallon mason jars would be easier to replace, store and move around. However, we found that, accounting for evaporation, displacement by the SCOBY, and saving a cup as the starter for the next batch, doing two half gallon jars per month yielded less than a gallon of finished kombucha. This did not seem like enough for our efforts. We could have simply done six or eight half gallon mason jars, but it seemed easier to just upgrade to larger containers. If you are only brewing for yourself, these might be fine for you. You really have to just get started, decide on how long your brew cycle is going to be, and how much you end up consuming each cycle. 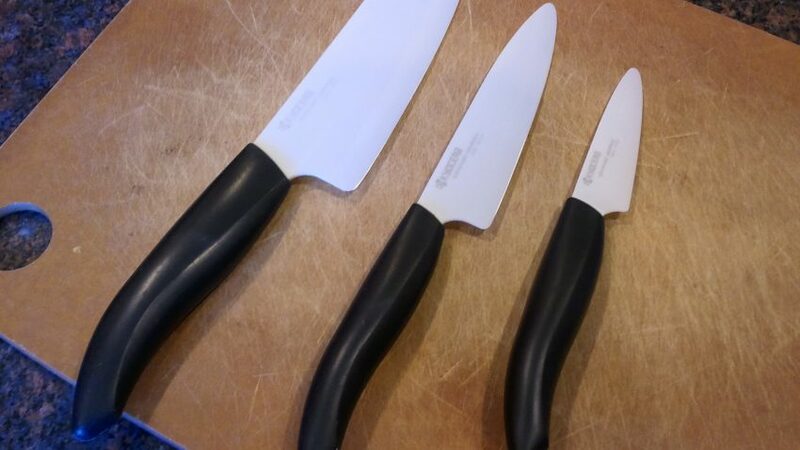 That will help you gauge the best size containers for long-term use. Two gallon glass jars for brewing kombucha. 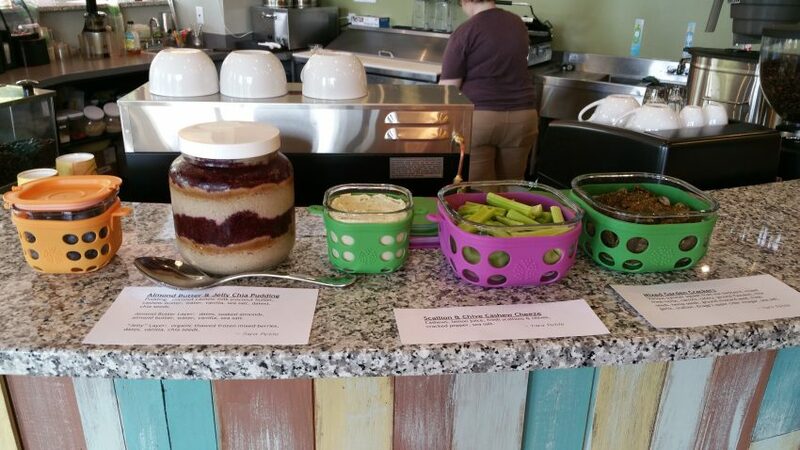 Eventually, based on our needs, we settled into some simple 2 gallon jars that have been a good fit for our routine. 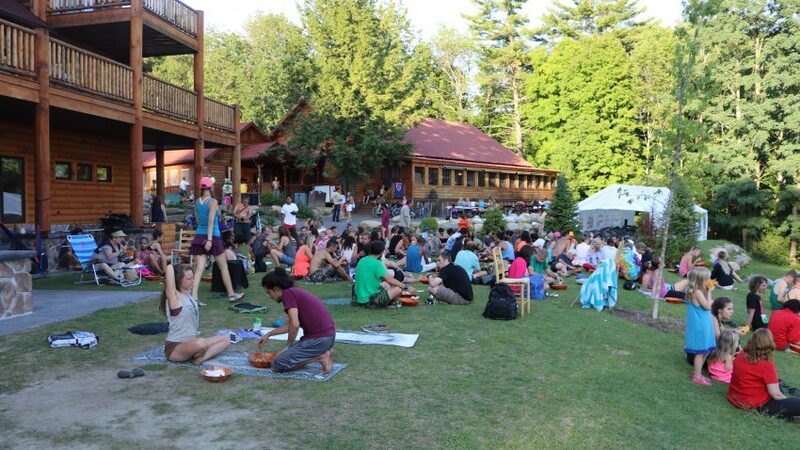 We drink kombucha, at least, four to five times per week, our kids drink a little here and there, and we love to share it with friends and at potlucks. So, brewing two, 2 gallon jars per months allows us to always have a bit of a surplus on hand. These jars, also, allow the SCOBY to grow quite large, as well as, make it easier to remove the SCOBY, as unlike the mason jars, the top of the 2 gallon jars is not tapered. We have had these jars for almost four years, and they are holding up great. They are a little more awkward to carry or move around when they are full, but, I have no problem carefully carrying them a few feet to set in their monthly resting spot. 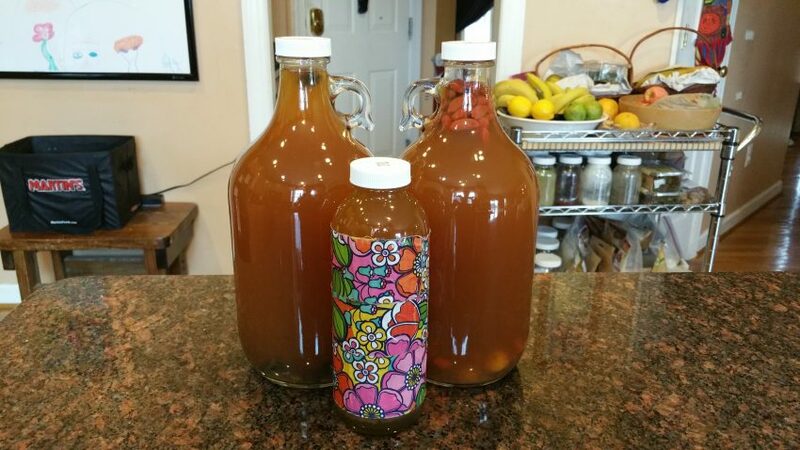 The Sun, Moon & Stars tea from Davidson’s Teas, is the perfect mix for kombucha. Now that you have obtained your SCOBY, it’s time to make your tea! Herbal tea will not work for kombucha. The SCOBY feeds on the caffeine and sugar to grow. And, you want a tea with no additional additives or flavors. We like Sun, Moon & Stars mix from Davidson’s Tea, which we subscribe to bi-monthly on Amazon.com. We use two 2 gallon jars, which requires about 3 and a half gallons of tea to fill, leaving room for the SCOBY and starter liquid. Therefore, I need to brew a large amount of tea. However, since I do not have a pot that holds almost four gallons of liquid, I simply brew a big pot (probably around 1.5 gallons) of very strong tea, and I add water to the concentrated tea in the final stage. Since I am using loose leaf tea, I never exactly measure my amounts. But, I estimate I use around 3 cups of dried tea to make my concentrate, which is diluted when added to the jars. If you are using bagged tea, I believe the ration is around 8 bags of tea per gallon of water. Again, the types of teas and quantities is something you have to play around with to find your preference. But, these are good guidelines to get you started. After our tea is brewed, I boil another small pot of water, in which I dissolve the organic sugar (1 cup per gallon), that I add to the tea after. For smaller batches, making one pot of tea, and dissolving your sugar right in that pot, while the tea is hot, works fine, too. But, I have just got my own system going and it works well for the amount of tea we use. Tea prepared in big bowl, ready to pour into 2 gallon jars to start new batch of kombucha. 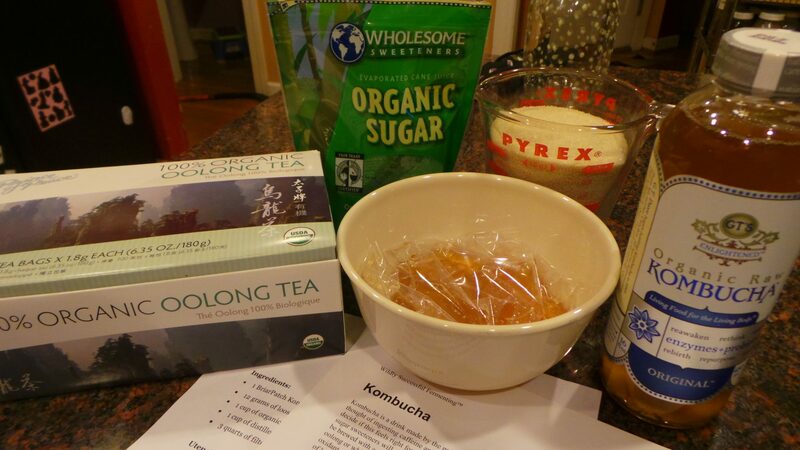 When we first started making kombucha, I hated using plain organic sugar, as I avoid it in my diet wherever possible. I thought maybe we could use more “natural” sweeteners like coconut sugar, or even, reduce the amount of sugar we used. 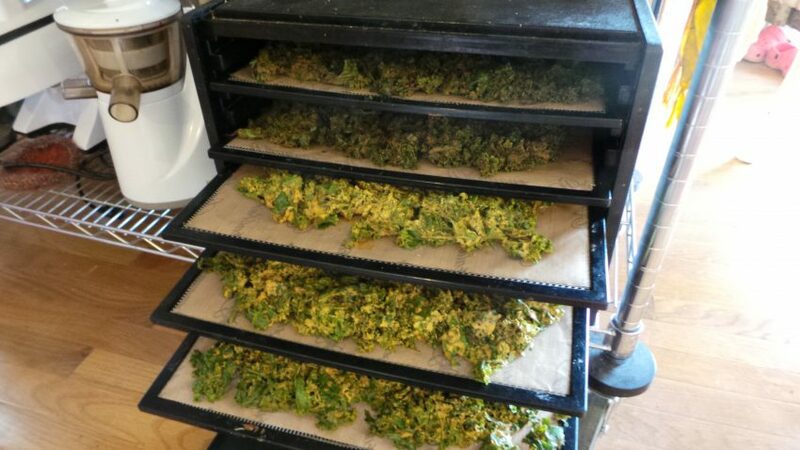 These attempts never went well, producing funky mold or just a weird taste. Henceforth, I never skimped on sugar, but I am, also, careful not to add more than the necessary one cup per gallon. Because we let our kombucha brew up to 30 days, starting with a little stronger tea and adequate sugar seems to produce a balanced flavor over that time, with most of the sugar being consumed by the SCOBY. We have tried less sugar before, but usually would end up with a stronger, more vinegary taste at the 30 day mark. So, we stick with 1 cup of organic sugar per gallon of tea. Finally, remember to let your tea cool to room temperature before adding the SCOBY. High heat will damage the culture, or render it unusable. So, don’t get impatient. I make my tea several hours before we plan to start our batch, and go busy myself with something in the meantime. Kombucha can be brewed anywhere from 7 to 30 days before it generally starts getting a wee-bit too tart and vinegary for most people’s taste. This is general knowledge we originally acquired from the Internet. But, we have, also, proven this to be true in our own experimentation. Going beyond 30 days starts crossing over into the vinegary realm. 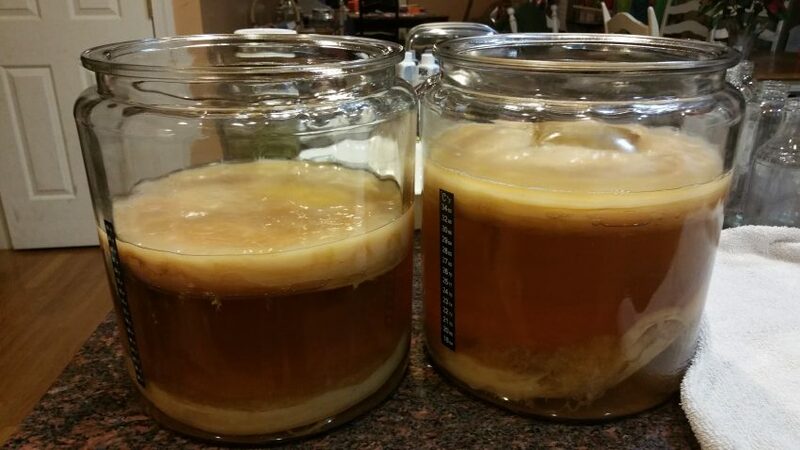 The longer your brew it, within the 7 to 30 day window, the more sugar and caffeine the SCOBY gobbles up. At least, that’s how it been explained to us. Many of the commercial kombuchas are brewed for 7 to 10 days for the first round, then another few days after it is bottled and flavorings are added. This results in a more mild and sweeter taste. Temperature will impact the brewing process, too. We’ve been told that between 70 and 80 degrees Fahrenheit is ideal, and that higher temperatures will yield a stronger kombucha more quickly. Our home’s artificially induced climate is generally set around 75 degrees, but we also use a kombucha heater strip to ensure consistency of temperature. We like to brew right up to 30 days, bottle and flavor, then let sit for another 5 to 7 days before refrigerating. When adding our flavorings (usually fresh or dried fruit, we throw in a pinch of dried stevia leaf, to offset the tartness, while keeping the sugar lower). Most people that like kombucha and try ours enjoy it. But, we have had a few newbies to the kombucha experience say they feel like it was too strong or sour for their tastes. And, of course, if given the choice, our kids would generally choose a bottle of store-bought, sweeter kombucha over our home brew. So, you really have to experiment with your preferred taste and adjust your cycle accordingly. You can do this by sampling it after 10 days to test its sweetness, and every few days after, until you reach your desired balance of sweet and tart. Frozen organic fruit (whatever is left in the fridge from the smoothie stash… strawberry, pineapple and mango make good additions, as well as, mixed berries and cherries). Dried organic fruit – we often use dried goji berries and dried mulberries as a quick and easy addition. 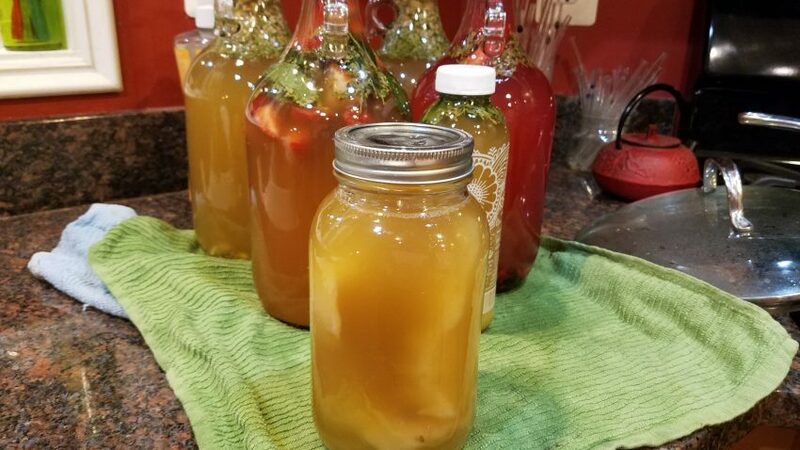 Once you’ve bottled your kombucha with your chosen flavorings, it’s time to set it aside on the counter, or less-trafficked area of your home, to do its work for a few more days. At this stage, we leave our to “gather fizz” for another five to ten days. It usually depends on when we remember to stick it in the fridge, so it chills up to drink. The Power of the Fizz – kombucha becomes naturally effervescent in the brewing process. 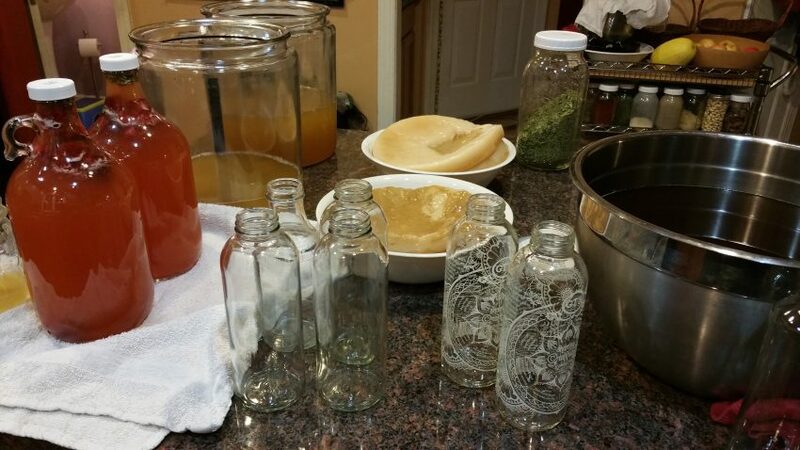 While sitting, bottled with its flavorful additions, the kombucha will become naturally fizzy. Many things seem to impact the degree to which it gets more bubbly, none of which we’ve been able to deduce with any clear logic of consistency. So, the magnitude of force that can come from the lid can vary greatly, regardless of how long you leave it or what you add to it. We have had a couple volcanic explosions. We’ll paint the ceiling to hide the stain someday. Accordingly, we learned, early in, to keep a firm hand on the lid when opening the final product, and to “burp” it a bit to test whether it is going to be a big “fizzer” or not. So, be forewarned, and temper your excitement to try your new creation with caution when you open that first lid! 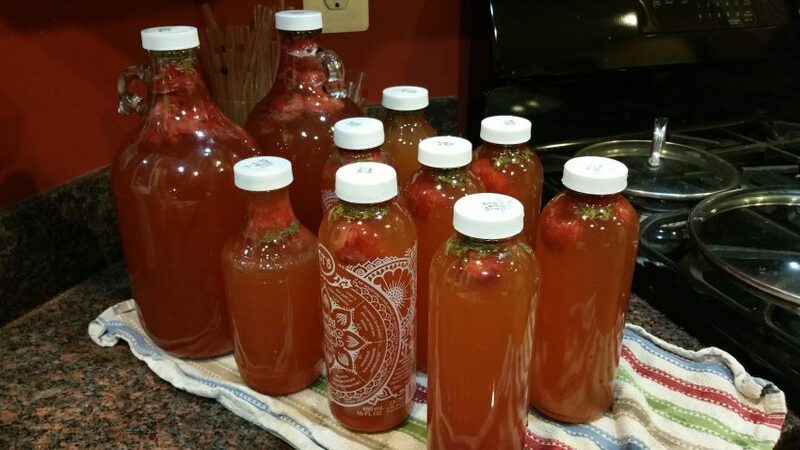 Kombucha makes a great gift or potluck contribution! Kombucha is not just a beverage, or a potentially healthful addition to your lifestyle. 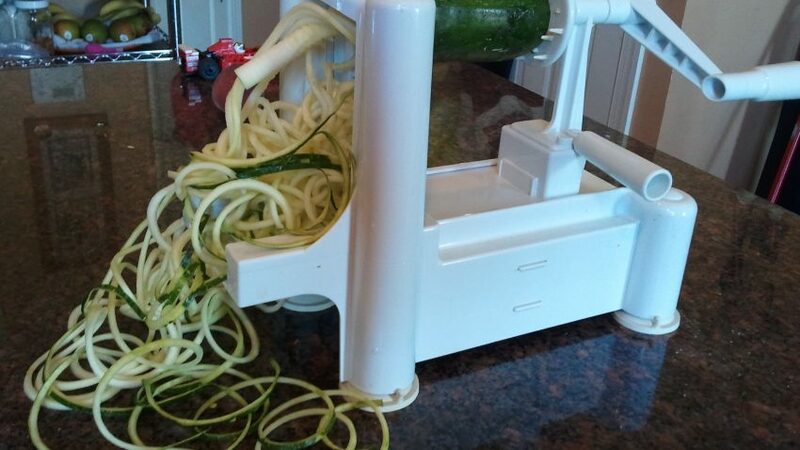 There is some ritual that becomes attached the process when you make it yourself regularly. It becomes a thoughtful pause in busy routines, the catalyst for conversation at gatherings, and a unique gift for the holidays. And, whether its long-term consumption will prove to be beneficial or not, the act of making it reminds us to be mindful of the moment, patient with the process, and reverent towards our natural environment that facilitates the transformation of tea and sugar into a probiotic-rich beverage. Hmm… Symbiotic Culture of Bacteria and Yeast… maybe in the SCOBY, there is a metaphor for the relationship between people and our environment. However, I’ll leave that for you to ponder while you gather your kombucha supplies. 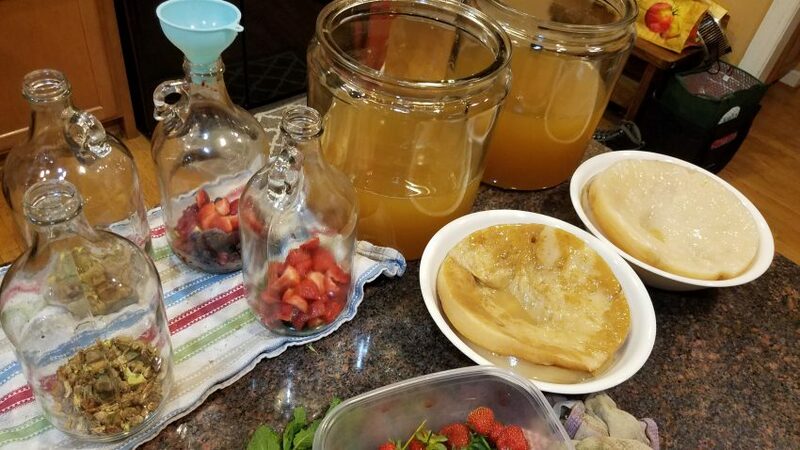 Despite many years of experience brewing it for our family, I do not claim to be an expert on kombucha, and my advice should be taken with a grain of salt (or a chunk of SCOBY). I cannot be held responsible if you create a noxious brew of moldy or contaminated kombucha and proceed to make yourself and friends and family ill consuming it. Please do your research, ensure proper supplies and sanitation, and be smart with your experimentation. Enjoy! 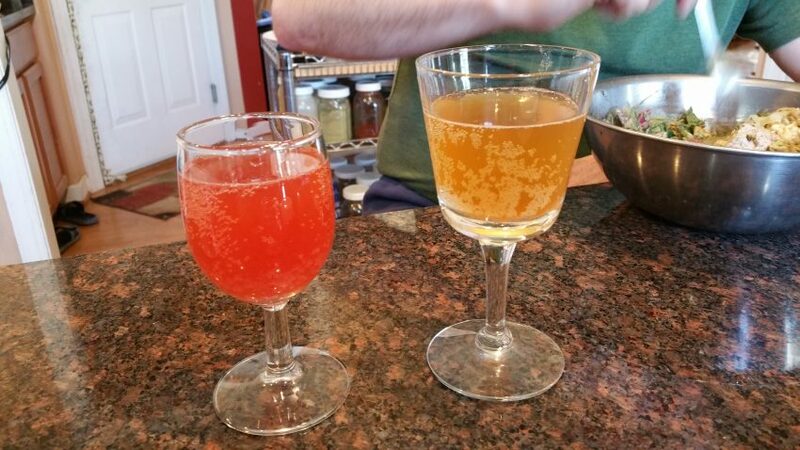 Kombucha in wine glasses makes a nice addition to a meal. 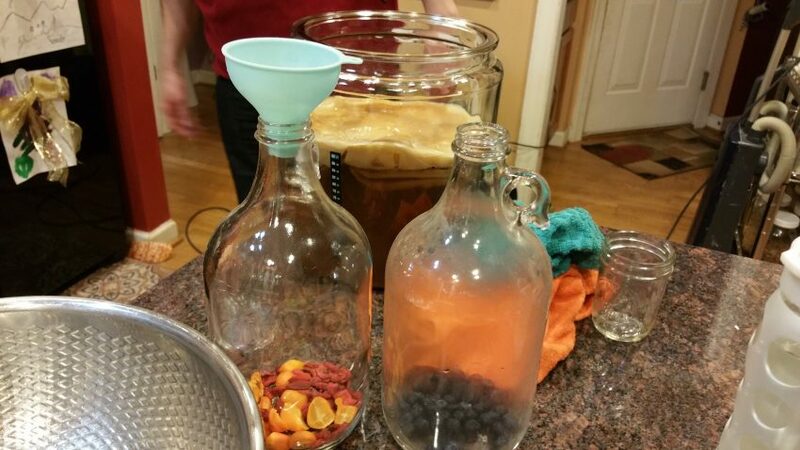 A couple years ago, my husband and I grabbed the camera during one of our monthly kombucha-making rituals, and documented our evolving process. If you would like a visual to put with my written kombucha story, feel free to head on over to YouTube and watch it. I thought our story might be worth revisiting for any parents that are struggling with childhood eczema (atopic dermatitis) and the challenges it presents. 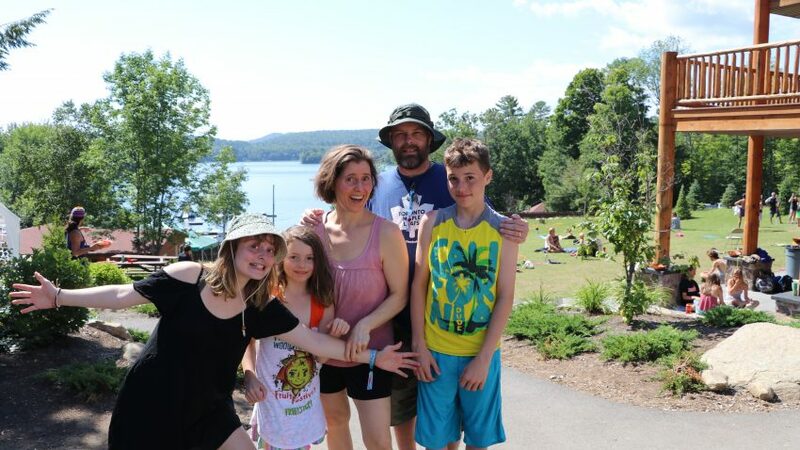 These insights about living with and managing this ski condition came about as a result of our experiences with our son, Joe. I hope by sharing our story, it will let other parents, faced with similar challenges, know that there is support available and hope for healing. We sure have learned a lot about eczema since Joe came along in 2002; particularly that it can be a life-altering condition for both the child and the parents, and it is important to be be well-informed and have a good support system. This is NOT intended to promote any specific product or therapy, and its sole purpose is to provide support and inspiration. My advice should not be used to diagnose any skin condition or to substitute for the advice of a professional health care provider. However, get informed, be proactive, and realize you have treatment options within and beyond the scope of mainstream medicine. Joe was born at our home in Connecticut on December 11, 2002, after a short labor. He was our second child (we now have three), and my husband, daughter, and I were thrilled to be welcoming a new baby boy into our family. Both of my pregnancies were fairly uneventful, and we had never had any health concerns with our first child, so nothing really prepared us for what was to come. As you can see in his pictures, Joe developed eczema on his face at about two and a half months old, and it quickly spread to his whole body. For a few months, he looked like a little burn victim, with sores covering large portions of his head, face, and arms. At around nine months of age, it subsided enough to give us some sense of normalcy, although he still had flare-ups and would scratch himself raw if we didn’t watch him constantly. Initially, we took him to the doctor, who prescribed a new cream, Elidel. Being uneducated about the immune system and eczema, and concerned about our child’s comfort, we tried a sample of the cream for a awhile. I guess I naively thought it would clear up and that would be that. Sadly, about a week later, Joe got very ill, with an extremely high fever. To make a long story short, he was hospitalized and diagnosed with Kawasaki Disease, which damaged his heart, causing enlargement of the coronary artery and two small aneurysms. Though I was assured numerous times that the Elidel cream could not have caused the illness, I nonetheless, felt compelled to pursue a more natural treatment of my son’s eczema, as there is no known cause for Kawasaki Disease, which in my mind, discounts nothing. Further, I now realized that Joe’s eczema would be a chronic condition that we have to manage, and not just a little rash that would go away in a few days. Therefore, immunosuppressive creams and steroids were not my method of choice to manage it. Of course, I am not discounting the usefulness of these drugs for many families managing this disease, but that’s not the route we chose. And, if you would like to avoid medications with unknown side-effects, you do have other options. This became even more clear to me after we waited several months to get an appointment with a highly recommended dermatologist at the prestigious Yale Medical Center. After a five minute appointment, and quick look at Joe, the doctor prescribed us a one pound tub of steroid cream and told me to slather him with it daily. I left that appointment feeling deflated. Yet, as I made my way downstairs to the pharmacy, with prescription in hand, I had a sudden resolve, sparked by Mother’s Intuition. I decided that day to NOT fill the prescription, and do whatever it took to treat Joe’s condition in the most natural way I could. But, having just been to one of the most knowledgeable skin doctors in the country, I realized I wouldn’t have a lot of support from the mainstream care professionals from whom I had been seeking advice… and hope. We just had to take one day at a time. At first, we helped manage Joe’s discomfort by using a natural eczema cream from Earthworm Herbals, which was a home-based herbal company in Massachusetts. We used this several times a day to moisturize all over, as well as on spots, when he had a flare up. When his skin was really oozy and looking borderline infected, we would clean the weepy spots with half peroxide, half water, then give him a lukewarm bath and then immediately rub him down with the cream. When out and about, I carried a less oily topical cream to use to make him comfortable, if needed. I used several natural, plant-based creams from the health store, including California Baby’s Calendula Cream, which we found very cooling. Thankfully, we’ve avoided the use of any oral antibiotics, though they were prescribed many times. I guess I just used my own intuition and judgement and felt we would get him through it, making him as comfortable as possible in the meantime, without starting an endless cycle of antibiotics. I did keep a tube of an antibiotic lotion that had been prescribed to us, just in case I ever felt anything was looking dangerously infected. But, thankfully, I only used it once or twice on spots where he had accidentally scratched himself deeply when we weren’t looking, while travelling. I think antibiotics definitely have their place, but for us, they were considered a last resort with regards to Joe’s eczema. Though in reality, it was only less than a year that we dealt with this condition at its worst, I feel like I’ve read every article, tried every cream, talked to every doctor and tried every supplement to help relieve Joe’s symptoms. Shortly after its onset, I began an elimination diet myself, as I breastfed Joe. 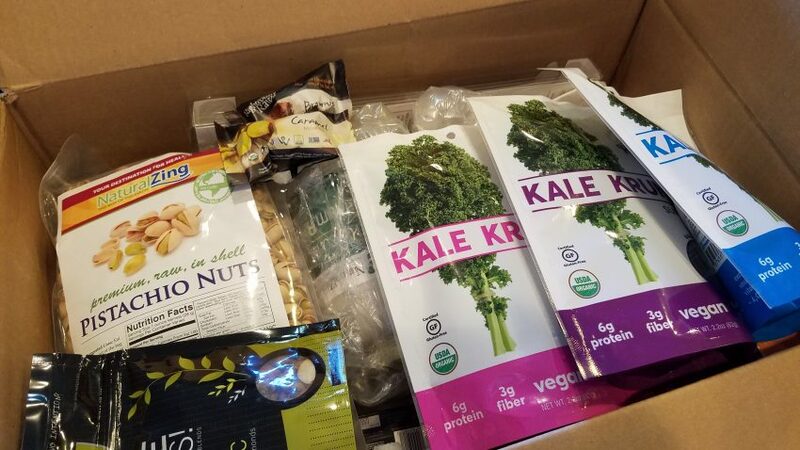 At the time, I was a less than health-conscious vegetarian, so I eliminated all the potential allergens, such as wheat, dairy, egg, soy and nuts. This basically left me on a limited whole foods diet. 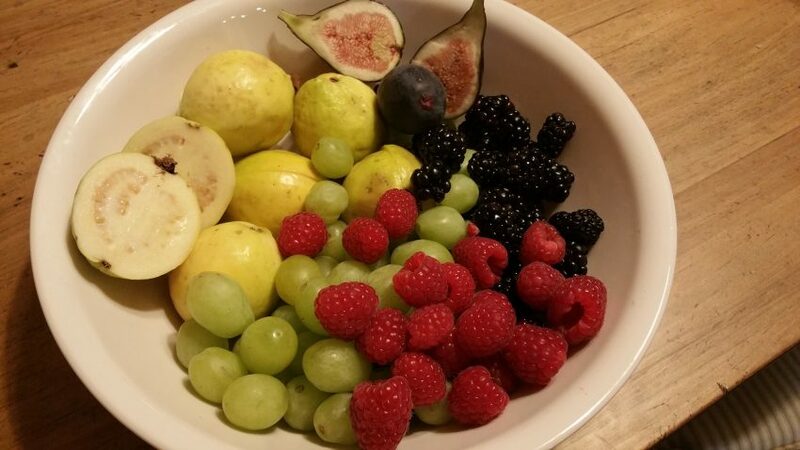 Though I lost some weight, and felt better, myself, by the end of three months, it was challenging to eat such a restrictive diet, since I was not accustomed to it, and also did not seem to make much of an impact on Joe’s skin. In fact, it wasn’t until we went on vacation to Newfoundland in July of 2003, that Joe’s skin started to improve a bit. 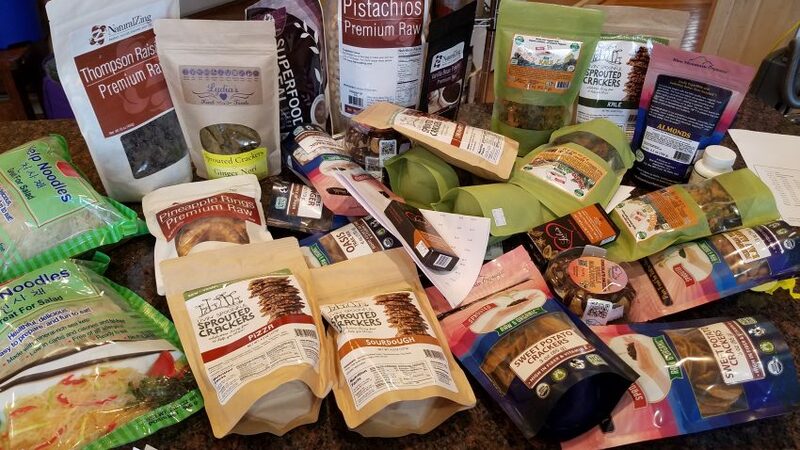 And, by this point, I had gone off the elimination diet, with the exception of still avoiding nuts and dairy, as those are things he tested very positive to on the allergy skin test. Looking back, however, the complete lack of pollution and very clean ocean air probably gave Joe’s immune system a jump start, and, in the long run, made us more aware of the importance of a holistic lifestyle to support good health. 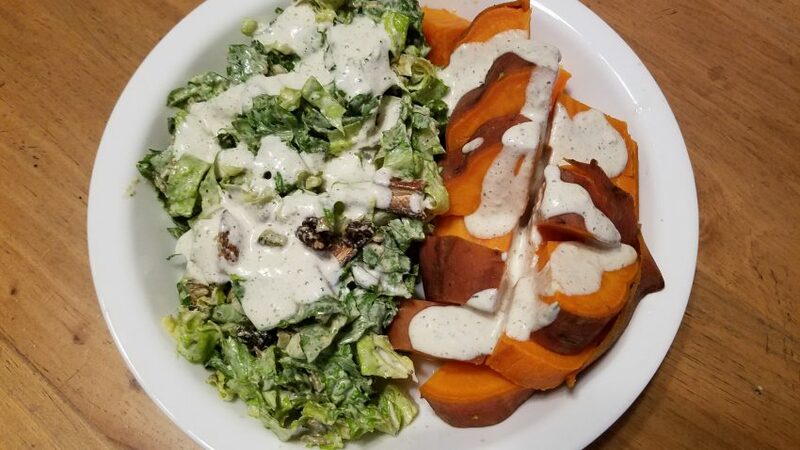 Accordingly, the three month elimination diet was really a fascinating experience, though, because never in my life had I had the motivation to eat so naturally. 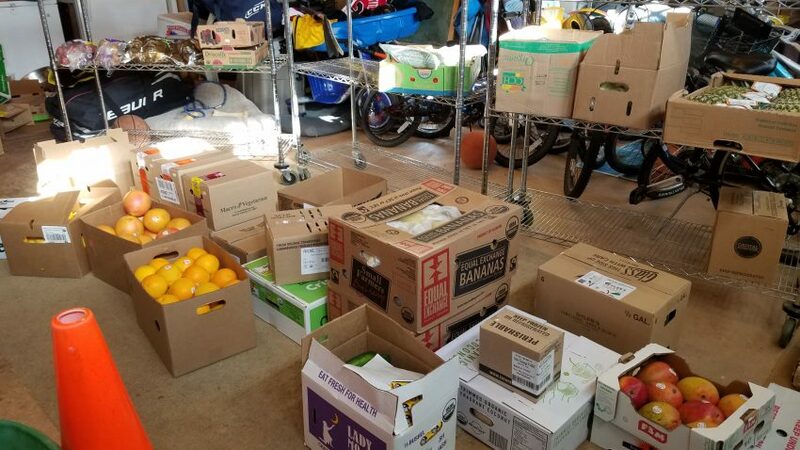 The possibility of helping Joe was a real motivator, and the side-effect of seeing how it feels to eat absolutely no processed foods, no junk foods, no sugar, etc. was interesting. I wish I could say I maintained that level of healthful eating indefinitely, but, I must admit, I succumbed to the social pressures and trappings of the American diet for several years after. 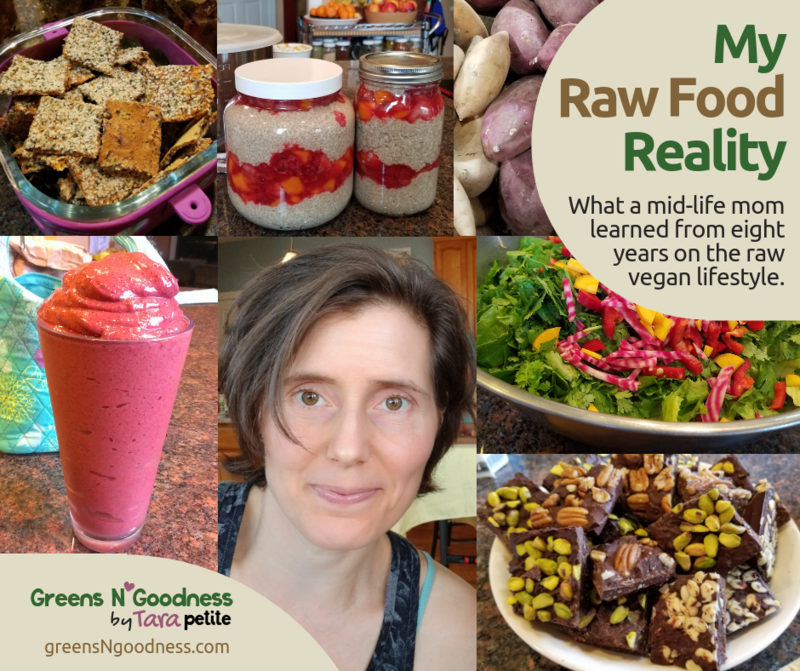 But, I believe it probably foreshadowed my interest in nutrition, eventual loss of over 100 pounds and transition to a whole foods, vegan diet. Despite not seeing huge differences in Joe’s skin as a result of my elimination diet while breastfeeding, I do not discount the importance of an overall healthy diet in the treatment of eczema, as a primary support for the immune system, whether it be second-hand via breastfeeding, or the child’s own diet. As we introduced solids to Joe, we were careful to note his reactions, and keep things as simple as possible. Because scratching is a major concern with eczema, much of our time was spent distracting Joe, keeping his hands busy, so he wouldn’t hurt himself. I trimmed and filed his fingernails every other day, and we put socks on his hands while he’s sleeping. We made some soft wristbands out of fleece to snap around his hands while in the car seat. Restraining him like this seemed so cruel at first, but we soon learned that he was much happier in the car if he couldn’t start a scratching frenzy. He could move his hands enough to hold a toy and scratch his legs (which we cover with pants), but not to get digging at his head and face. At the beginning, I didn’t know how I’d ever go anywhere alone in the car with the kids, because every time I would go out, he would be bleeding by the time I got where I was going. But, we devised ways to make it to and from our destinations with minimal injury, and life found a new patterns and routines to manage our itchy passenger. At home, Joe slept with one of us all the time, so we could be aware if he was starting a scratch fest in the middle of the night. Thankfully, despite his itchiness, he was always a good sleeper. But, this constant diligence definitely came at the expense of my own and my husband’s sleep quality, and in that first year, we both racked up quite the sleep debt, and probably knocked, at least, a few months off our life expectancy. But, our diligence paid off, and it strengthened our marriage, acting as the Anti-Itch Team! From an emotional standpoint, in some ways, it almost felt like we were dealing with a child with a disability. Thankfully, for parents of children with eczema, there is always the hope that the condition will subside with age, even in the most severe cases. However, it definitely brings with it some emotional challenges when we are going through it. First and foremost, when you have an infant with severe eczema, your whole focus becomes keeping the baby comfortable and keeping them from scratching themselves raw. And on some level, it’s hard not to feel deprived of that special time with your cute little baby. I know, at first, I felt cheated because my whole focus was just on keeping him from getting infected. I couldn’t hold him the same way I did with my daughter, because if I held his face against me, he’d just rub on my clothing until he was bleeding. Though nothing would light up my day like his smile, some days, I was just so emotionally and physically drained, that it was hard to feel very hopeful about anything. To compound the fatigue and hopelessness, I often felt guilty that I was not giving my older child enough attention and that her experience of being a big sister was all about Mommy being stressed and exhausted, and making sure not to touch Little Joe’s “boo-boos.” But, we got through it, and I can now look back on the experience and all it taught us. Eczema is, unfortunately, is a condition with which many new parents will be faced. Though much of the research regarding the success of treatments is focused on the mainstream medical approach, the challenges of treatment are similar, no matter the modalities you choose, including sticking to care routines while trying to maintain balance in the rest of our lives. The impact on quality of life is real, with sleep disturbances and itching being primary contributing factors.1 But, keeping in mind that this is a phase of life, and the odds are in your favor that your child will improve over time, will help you maintain a more positive outlook. As Joe grew, we continued with our daily moisturizing routine, but overall things got much easier. He still had very dry skin, and his wrists, back of his knees and cheeks still flared up a bit on and off, but nothing to the degree of his first year, which made managing it a whole lot easier. He was still a little itch monster, though. I don’t know if was just out of habit, or from the dry skin, but we still kept him in 100% cotton clothing, and he didn’t get to run around “nudey” too much, or you would find him in the corner scratching himself. As his diet expanded, we tried to avoid all processed foods and the things he was allergic to and noticed that his skin was much nicer. We, also, continued to use natural, simple ingredient eczema creams on any flare-ups, and once a day just to moisturize. I feel that Joe is one of the “lucky” ones that the doctors said often “outgrew” eczema in the first few years of life. But, I don’t think this luck was a completely random phenomenon. I think it was fueled by our willingness to trust in more natural treatments, weather the storm on our own, and, maintain faith that if we provided the right conditions, Joe’s little body would fight to heal itself. Joe still has some serious allergies, and this alone has been challenging. But, he has developed into an active, happy kid with little to no memory of his infantile health challenges, and the constant distraction of itching. I remember when Joe was five or six months old, we took our daughter to the doctor for a check-up, and the doctor noticed how bad Joe looked with all the eczema on his face and his head wrapped in gauze and he said, “Don’t worry. It will get better.” I remember thinking, in my sleep-deprived state, “How can he say that? He doesn’t know, and I’ve never seen a child with eczema as bad as Joe!” But looking back, the doctor was speaking from wisdom, and was right. Not only did Joe get better, but our ability to deal with his condition improved, as well. Overall, eczema definitely presented a new challenge to our lives. We had to find the tools that worked best for us in managing it, making our son as comfortable as possible, and maintaining a sense of gratitude for all the resource and support we did have. Before I had Joe, I used to think eczema was some little patchy rash people got on their elbows or something. I had no idea of its potential severity. I feel a special bond with the other parents I have met who have children that suffered with severe eczema, as it is something you just can not imagine unless you have experienced it. As I update this today, 15 years have gone by and Joe is settled in nicely to his teens! He’s a happy, thriving kid, with tons of energy and no real memory of his struggles with eczema or Kawasaki Disease. Aside from managing his food allergies, and a mouthful of dental cavities around age ten, overall, he has been a healthy guy. He is an avid hockey player and has not had to deal with any skin issues, with the exception the occasional patch of hives from a contact or food sensitivity. When I reflect on the mindset of my 15 year-ago self, I remember how all-encompassing Joe’s condition felt, and I’m grateful it’s a story of growth I can now tell with a positive outcome. 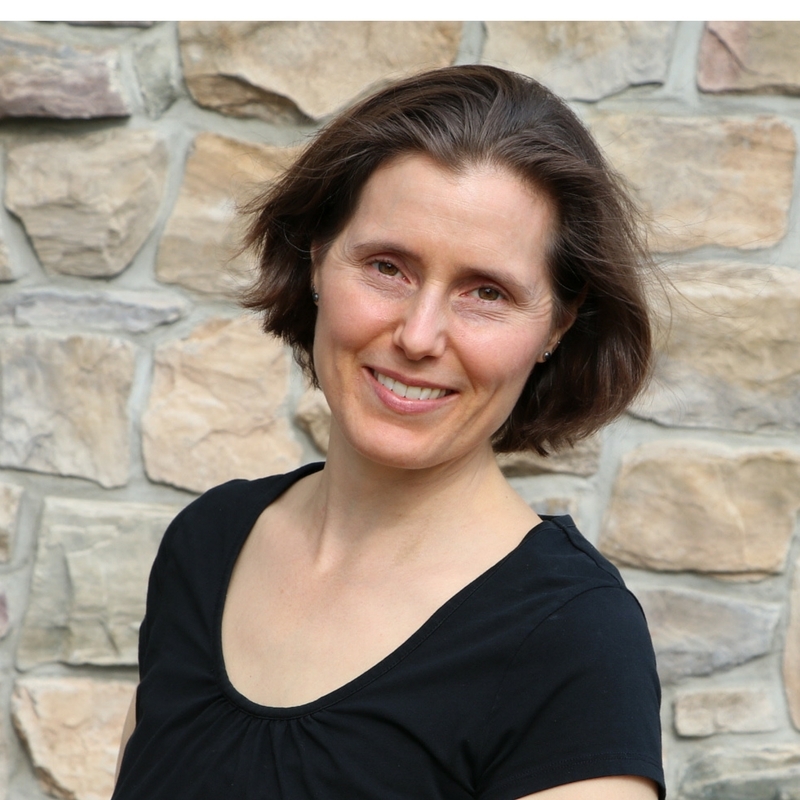 I see managing childhood eczema, from a holistic perspective, to include three primary objectives; minimizing discomfort, focusing on healing, and continued lifestyle habits that support a healthy immune system and balance. Whichever treatment options you choose, try to get into a good routine, asking for help when you need it. This will allow you to take care of yourself, so you can maintain good emotional and physical health as a primary caregiver. You are part of your child’s treatment process, and the energy you bring forth is important! 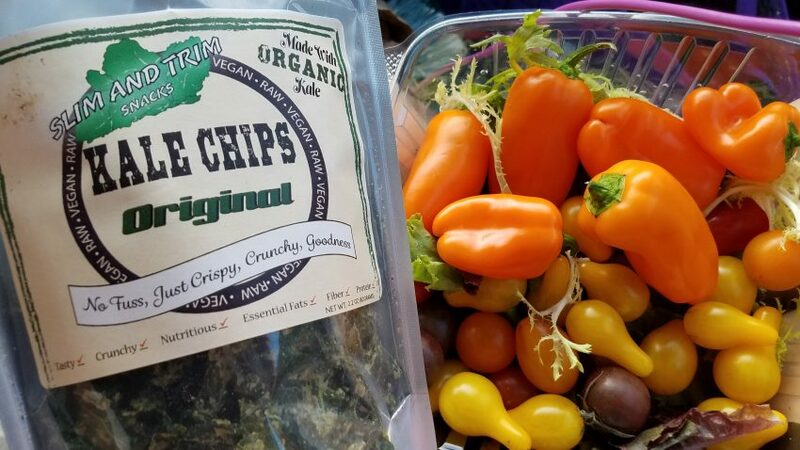 Some basic lifestyle shifts eczema prompted for us included maintaining a fairly chemical-free household, following a whole foods, vegan diet (though, Joe is a teen now, so vegan doesn’t always equal healthy choices on his part), and we emphasize the importance of sunlight, time in nature, positive relationships and good sleep to foster a sense of balance. 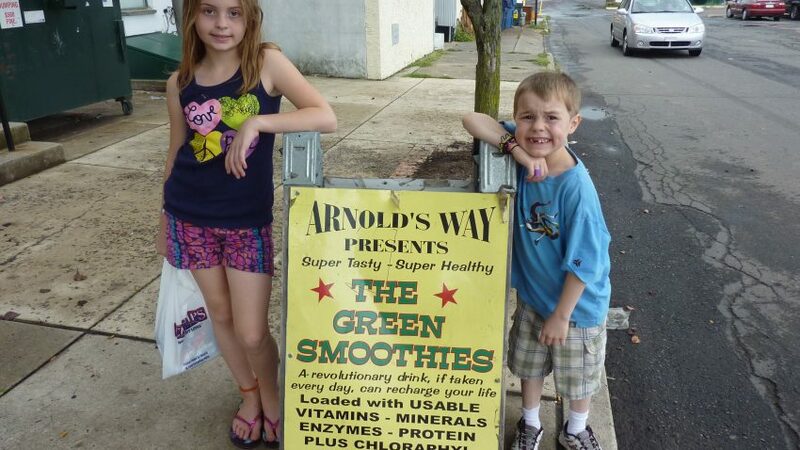 Basically, we just do all we can to support a healthy immune system and balanced health. I certainly hope that if any new parents with children with eczema are reading this, that it gives you hope that it does not have to be a life-long condition, and there are plenty of things you can do to empower yourselves to care for your child, in addition to the recommendations you may get from medical professionals.